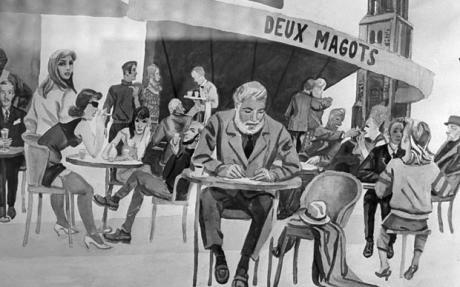 An alternative title for this blog post is “Taste of Food and Drink in Hemingway.” However, the title of Milan Kundera’s 1984 novel captures the essence much better. Both writers’ works are characterised by lively accounts of sensory experiences – the taste of wine and good food, the experience of a sunset across a city, an encounter with a lover. This literary technique brings their stories alive for the reader, painting taste and touch pictures with mere words. In doing so, they articulate the ‘existentialist’ ethos of the 20th century. Against a backdrop of war, political regimes, and rapid social changes, the writers contrast simple sensory experiences to meditate on the mystery of being. The man hunched over his motorcycle can only focus on the present…. he is caught in a fragment of time, cut off from both the past and the future…. he has no fear because the source of fear is in the future, and a person freed of the future has nothing to fear. Existentialism posits that individuals are responsible for giving meaning to their lives. Those who do are termed “authentic”, showing courage to reject the meaning imposed upon them by tradition, religion or political regimes. Those who do not impose meaning into their lives, can easily drift into nihilism. Both writers seek to ground their lives in the beauty of freedom, and sensual experiences. Set in Prague Spring of the 60s, Kundera’s novel explores the question of whether any meaning or weight can be attributed to life, since humanity only has the opportunity to live once, a fleeting ephemeral existence. The novel follows the life and loves of Tomas, a talented surgeon and an avowed philanderer, who though married to Tereza, cannot give up his mistresses. The novel explores his relationship to the various women in his life, and to his definition of love and meaning. The novel intertwines their story with Sabrina, a talented painter and Franz, her lover all set against the backdrop of the invasion of Prague by the Russians. Ultimately, Kundera argues, we cannot find meaning; where meaning should exist we find only an unbearable weightlessness. 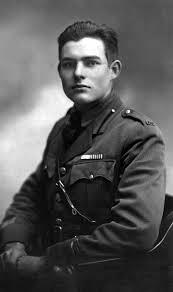 Similarly, Hemingway, writing in the 1920s, was part of the “Annes Folles” or “the Crazy Years” so called because of the fertile social, artistic, and cultural collaborations of the period after the First World War. His generation was also nicknamed “the lost generation”, so named because their youth was grounded in the optimism of the late 19th century and their prime punctuated by World Wars, The Great Depression of the 1930s and the rise of Nazi Germany. Both writers turn their art to ‘meaning creation’, capturing the sweetness of life, through taste and touch, no matter how fleeting nor how uncertain. Each writer, a poet to life, meditates on the lostness, the lightness, of being. An earlier post, Pied Beauty, touched on the sensory experience of language. 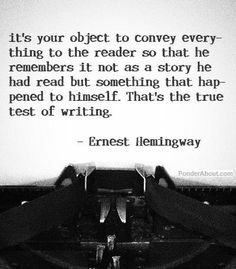 Good writing lies in the authors’ ability to make the reader see, hear, taste, touch and feel. Unlike logic and rhetoric, the power of story is in its ability to make us feel, and so, to remember. 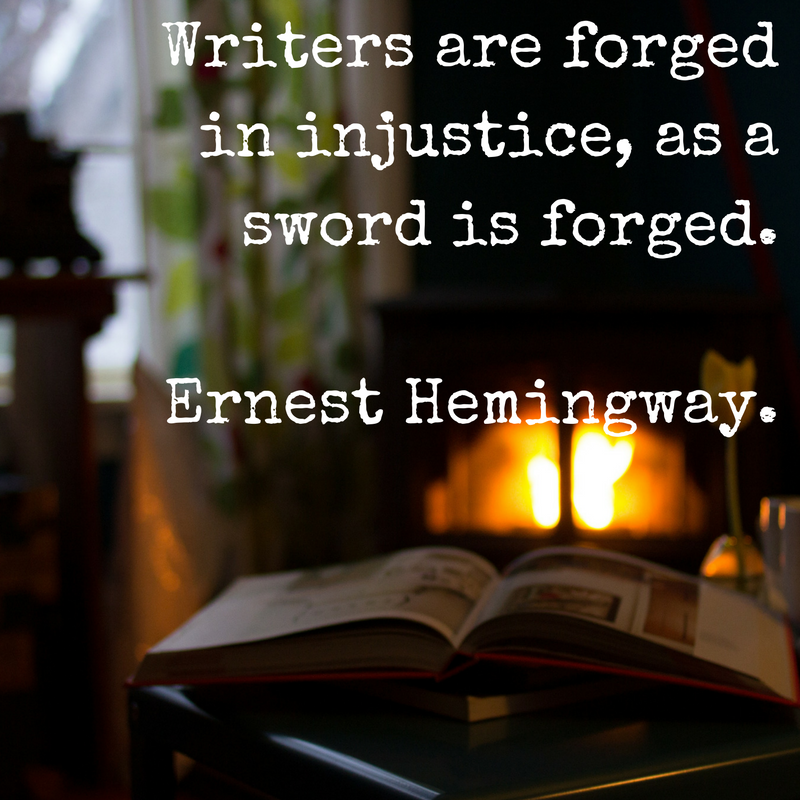 One such writer who has a genius for making the reader feel, is Hemingway. use short sentences … use vigorous English. Be positive. He worked only six months before volunteering for the Red Cross to become an ambulance driver in Italy. He left New York in May 1918 and by June was at the Italian Front. His experiences are recorded in several of his works. In Death in the Afternoon  he recounts searching through rubble in Milan for fragments of bodies. His wounding by mortar fire and susbsequent convalescence in a hospital in Milan is recounted in his semi-autobioraphical novel Farewell to Arms . The young Hemingway fell in love with American nurse Agnes von Kurowsky. In his novel, the young solider and nurse, escape Italy to Switzerland overland and by boat where she dies in childbirth. However in reality, Hemmingway was discharged and returned to the USA in January 1919, intending to marry Agnes. By March she broke his heart by writing to him that she was to be married to an Italian officer. 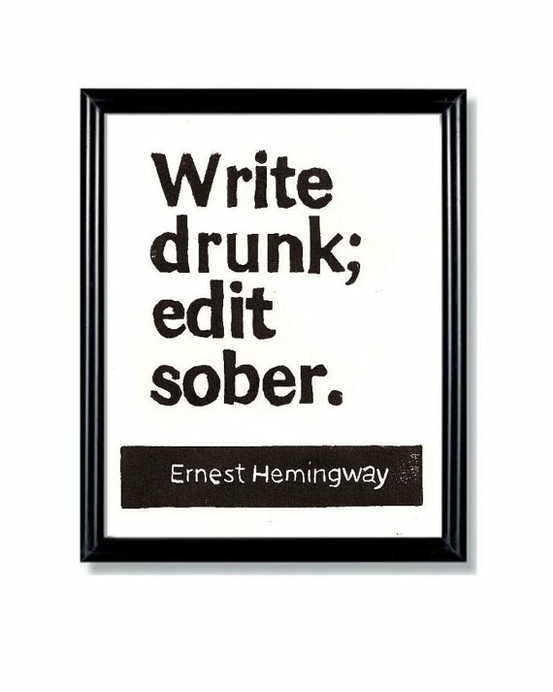 Back in the USA, Hemmingway worked again as a reporter and editor but he was restless. He met and fell in love with Hadley Richardson, the sister of a friend and they married in 1921. Two months later he accepted a role as foreign correspondent for the Toronto Star and the pair sailed for Paris. Post-war Paris was a cheap place to live, the American dollar being strong. 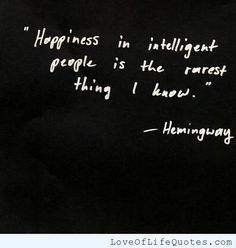 There Hemmingway fell among a gathering of “the most interesting people in the world”. Writers, artists and thinkers gathered in Paris to enjoy a golden age of intellectual and cultural fervour. 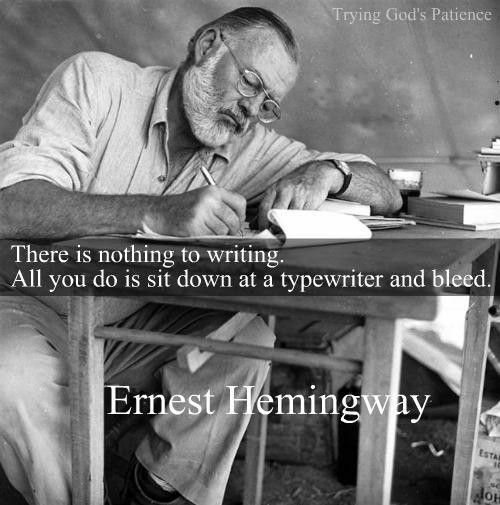 Here Hemingway wrote some fiction and poetry while working as a reporter for the Toronto Star. He covered contienental politics and completed some travel pieces. 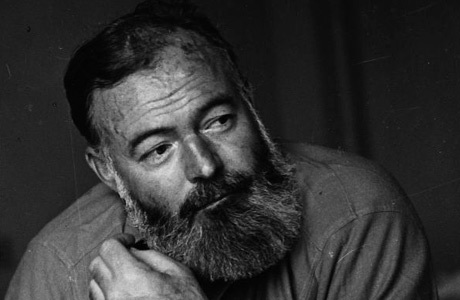 Hemingway’s writing is peppered with his love for drink and for women and for food. His work is a sensory feast. As his words amble, so do his feelings – the way a drink makes him feel, the meal he eats as he waits for his son to be born, the feeling for a woman he cannot have, his disgust for his compatriots behaviour, the weather, the feeling of the weight of a fishing line, the methodical rthyms of a day, the passions a man gives to his work. Everything is recounted in a beautiful spare style, the writing takes the reader along on a sensory journey through experience, without judgement. 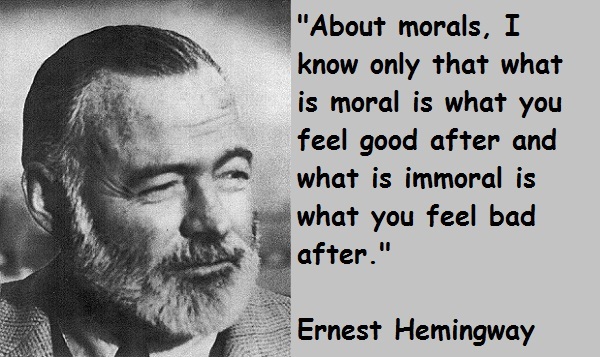 Hemmingway does not moralise. There is no right and wrong in his world, no good and bad, just feeling, feeling for the women he loves, feeling for his sons, feelings for his friend and colleagues, feelings for his work, feelings for the nations he encounters and the people along the way, feelings for the drinks that transport him into a sense of wellbeing, the meal that caps off the day. the best I can write ever of all of my life. It won him the Pulitzer Prize in 1952. In 1954 he suffered a series of accidents while in Africa and newspapers prematurely published obituaries of him. After these injuries caused him much pain and his heavy drinking turned into alchoholism. In October 1954, he was awarded the Nobel Prize in literature, a prize he is reputed for declaring belonged to Isak Dinesen and other writers. His health deteriorated greatly from here. In 1956 he traveled to Europe and discovered a trunk of notebooks in the Ritz which had been left there from his Paris days. Excitedly he began the memoir of the time, A Moveable Feast , and completed Garden of Eden  and Islands in the Stream . By 1959 he had slid into a depression from which he did not recover. 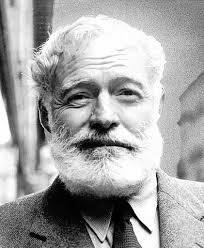 In the morning of July 2, 1961, shortly before his 62nd birthday, Hemingway shot himself with his favourite gun. A heavy drinker he likely also suffered from a genetic condition causing an inability for the body to metabolise iron, resulting in physical and mental deterioration. Hemmingways’ writing is poetry. Poetry to life and all the senses. His existence in the early 20th century was something magical and something lost; free from social constraints life was filtered through the senses, fully experienced without judgement. His drinking and poor health perhaps took the better of him, or perhaps his sensitive heart could take no more of life. Nevertheless, his life is an essay to his philosophy of being. A song to his generation, who had jettisoned the certainty and moralism of the 19th century and lived adrift and alive, experiencing the shocks of wars, of loves and losses. What a piognant full stop to his life is his suicide and death. 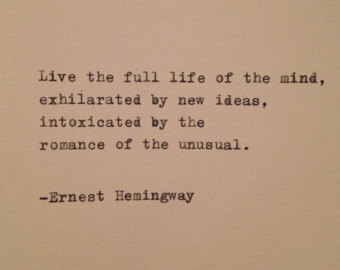 Hemingway seemed to not care about the end, only the living. Subsequent generations have moved beyond modernism into post-modernism and we currently experience an awakening of spirituality in arts and culture. Thoughts again are given to death as well as to life, to morality beyond immediate sensory experience. Nevertheless, Hemingways’ writing remains a lovely collection of impressions,senses conveyed through word and syntax.